Although this ended up being Hibs’ biggest win of a grim season they achieved it the hard way, going a goal down in the first minute and surviving a penalty miss by Airdrie later in the first half. This was never going to be an uneventful match, and with a further three penalties awarded and Jimmy Sandison sent off for elbowing near the end it lived up to expectation. Darren Jackson scored two of the penalties for Hibs to secure the tie and Hibs survival in the Premier League. It was the end of Jackson’s Hibs career, however, sold to Celtic for £1.25million in the summer. His return to Edinburgh two years later to play for Hearts completed his transformation from hero to villain. Keith Wright had also played his last game for Hibs at the age of 32, and Jim Leighton was lured back to Aberdeen by the offer of a player-coach role at his first club. Perhaps they also saw the writing on the wall in this nerve-shredding brush with relegation. 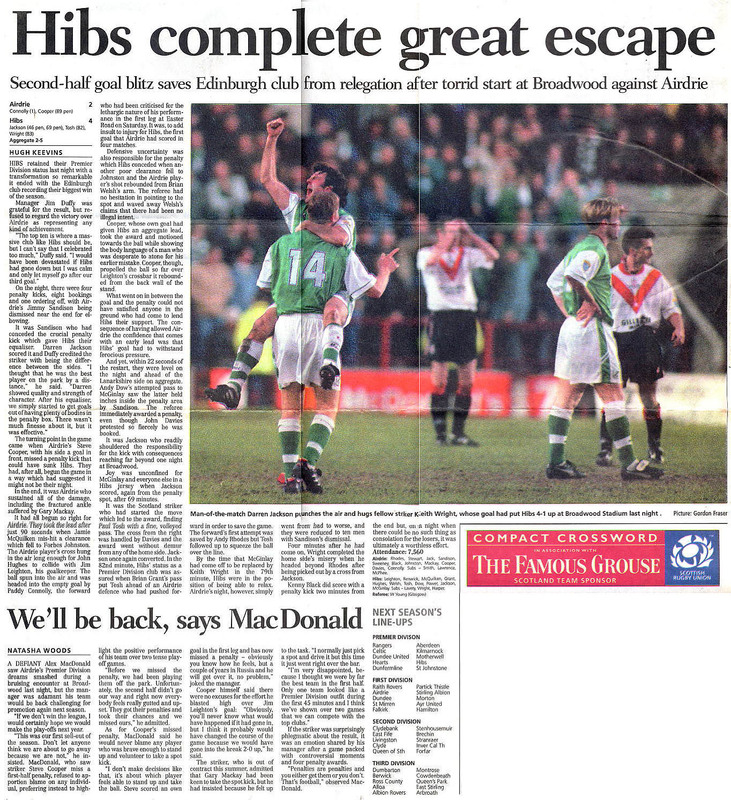 Categories: Press cuttings | Tags: Airdrie, Broadwood, Darren Jackson, Jim Leighton, Jimmy Sandison, Keith Wright, play-off, relegation | Permalink.